Peru's Attorney General Pablo Sanchez talks to Reuters during an interview at his office in Lima, July 17, 2015. Peruvian prosecutors plan to visit Brazil this month to gather evidence of bribery on a transcontinental highway project, Peru's attorney general said in an interview, adding to regional fallout from the biggest corruption scandal in Brazil's history. The mission laid out by Peruvian Attorney General Pablo Sánchez is the most public sign yet of international cooperation on a case that has jailed heads of major Brazilian engineering groups as police comb bank records for evidence of a cartel. Regional interest in the probe exploded last month, when Brazilian police arrested the chief executive of Odebrecht SA , Latin America's biggest construction company. His arrest has put billions of dollars worth of infrastructure projects in the region under fresh scrutiny. Ecuador opened audits of Odebrecht's contracts. Colombia's vice president warned that the company could be banned from public bids for decades. Investigators in the United States and Panama have also been collaborating with Brazilian authorities. The probes have shocked Brazil's well-connected construction companies. The most visible face of its regional diplomacy, they have often beaten Chinese and European rivals for Latin America's energy and transportation mega-projects. FILE - Federal police cars are parked in front of the headquarters of Odebrecht, a large private Brazilian construction firm, in Sao Paulo, Brazil, June 19, 2015. None has a higher regional profile than Odebrecht, which accounts for nearly three quarters of infrastructure built by Brazilian companies abroad. Its projects include a port in Cuba, subways in Venezuela and even a 10-story statue in Lima reminiscent of Rio de Janeiro's famous Christ the Redeemer. "The message Brazil is sending with an investigation of this scale - and we will echo if we find evidence here - is a clear battle against corruption in the region ... whoever it takes down," Sánchez said in a late Friday interview. He said his team planned to interview witnesses and study documents gathered by Brazilian investigators in the southern city of Curitiba. Peruvian prosecutors are chasing allegations that surfaced in the local press last month, citing Brazilian police reports, of bribes paid by construction executives to inflate the cost of a highway linking Brazil's Amazon rainforest to Pacific ports. Sánchez declined to name suspects in the initial eight-month inquiry. The highway was built by several of Brazil's biggest construction firms, including local divisions of Odebrecht, Camargo Correa, Andrade Gutierrez and Queiroz Galvao. Those companies' headquarters in Brazil were raided over the past year and their executives arrested in a probe of alleged bribery and price fixing at state-run oil company Petroleo Brasileiro SA. Odebrecht, Andrade Gutierrez and Queiroz Galvao denied in statements that they had any part in alleged corruption in Brazil or Peru. Odebrecht's Peruvian spokesman, Fernán Altuve, said the company "will let [investigators] turn the house upside down and check under every cushion if necessary, because it is sure the work was done correctly." Odebrecht added in its statement that bribery allegations for the Peruvian highway project were focused on a stretch of the route that the company did not take part in. Camargo Correa said it was collaborating with investigations underway, adding in a statement that it was "working on efforts to rectify irregularities and improve corporate governance." Bond prices for the companies have tumbled on concerns that they could pay steep fines and lose access to valuable public contracts in Brazil. Prices on Odebrecht bonds slid further in recent weeks due to investigations spreading throughout Latin America, according to traders. About 44 percent of the Odebrecht Group's revenue and around 70 percent of its construction contracts are outside Brazil. The Peru division is Odebrecht's oldest foreign operation and the largest by workforce, but the company has deep roots around Latin America. In Colombia, where Odebrecht won contracts for a nearly $1 billion river-dredging project and a $2 billion highway, Vice President Germán Vargas Lleras told journalists in June that the company could be banned from public contracts for up to 20 years if convicted of graft. In Ecuador, the comptroller general announced new audits last month of Odebrecht's contracts, which have included hydroelectric and refinery projects in recent years. Odebrecht said in a statement that Colombia and Ecuador were conducting routine contract audits, not formal investigations. Panama's attorney general, Kenia Porcell, told Reuters in an interview she had received a request for cooperation from Brazilian prosecutors, but Panama is not conducting its own probe of Odebrecht "at this time." Brazilian investigators have also said they are working closely with the U.S. Department of Justice and Securities Exchange Commission. Neither of the agencies have commented on any ongoing probes and Odebrecht says it has received no formal notification of U.S. collaboration or investigation. 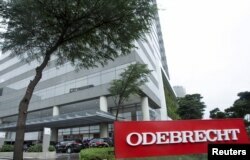 Lawyers specializing in white collar crime told Reuters that Odebrecht, which has a U.S. subsidiary and sells bonds in New York, may face prosecution under the U.S. Foreign Corrupt Practices Act if it paid bribes to public officials anywhere. If charged and convicted under the act, the company could face steep fines and the possibility of losing access to some U.S. contracts, which have included a Miami basketball arena and highways in Texas and California over the past 25 years.